Lemon Boy VFN Hybrid. 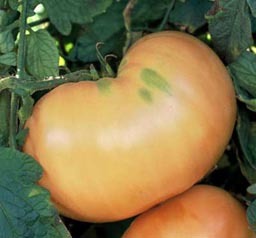 The first lemon yellow, not golden, tomato variety, and still one of the best. Extremely vigorous plants produce large harvests of attractive fruit that weighs 8 ozs. or more. Flavor is outstanding, mild and sweet yet tangy and definitely not bland. This one is easy to grow and understandably one of our most popular yellow tomatoes. Indeterminate. 72 days. Lemon Boy was very prolific, tasty and disease free in 2008, so it gets planted again! Catalog description: 'Big Beef' is generally ready for harvest 80 to 85 days after sowing. 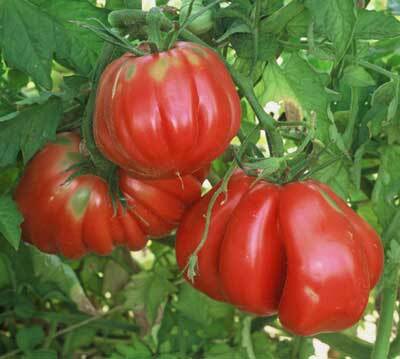 Vigorous, indeterminate plants produce 4 to 6 inch tomatoes which are crack resistant. Sweet, slightly acidic flavor. An All-America Selections Award Winner. Resistant to V, F1, F2, N, TMV, and ASC (Alternaria Stem Canker). Sept. 2008 report: Probably the best overall tomato in our garden in 2008. Big Beef was excellent either sliced or for canning. Easy to peel for canning. Productive early and often! 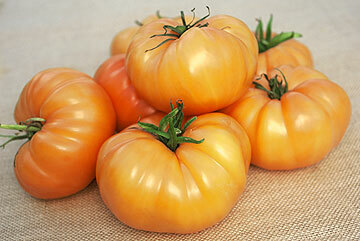 1 lb., deep orange beefsteak tomatoes that are thin-skinned, meaty, and have a fantastic sweet, tangy flavor. Juice and inside flesh have the same bright orange color as orange juice. Indeterminate. 80 Days. An excellent flavor. 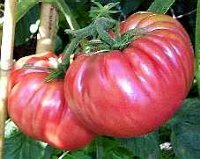 Marianna's Peace is a late season, indeterminate, potato-leaf variety (80-85 days) from Czechoslovakia that produces relatively lower yields of 1-2 lb., pink/red, beefsteak-styled fruit. It's plant and fruit structure and the taste of it's fruit remind me of an old favorite, Brandywine. Overall, it's flavors are exceptionally rich, with good sweet/acid balance and luscious complex flavors reminiscent of the finest of those "old-fashioned" tomato flavors, the memories of which is the stuff-of-dreams for all tomato lovers. 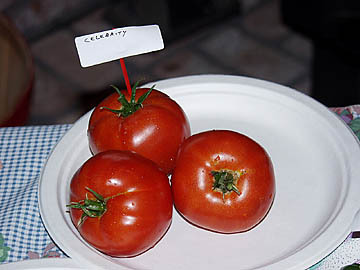 Sept. 2008 Report: Mediocre production, but the tastiest tomato in 2008, especially in salads. Worth another try in 2009. FT Hybrid. Vigorous vines produce abundant clusters of 1/2 oz. 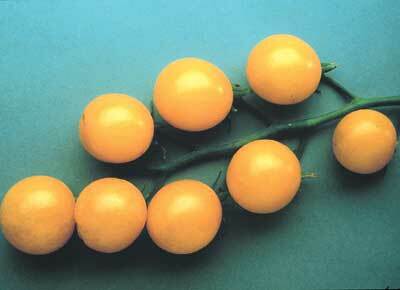 bright yellow-gold cherry tomatoes with delicious sweet flavor. 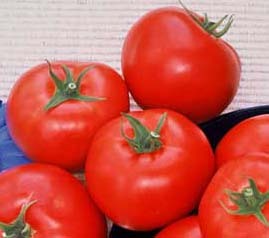 These tomatoes are naturally sweeter than red cherry varieties with a fruitier taste. Once you taste them, you'll be spoiled forever. Indeterminate. 60 days. Our favorite cherry tomato from last year, 2007. Sept. 2008 report: Our favorite cherry tomato of 2008! Productive and tasty. Backyard visitors couldn't help but munch them straight from the vine. Can Sweet Gold Three-Peat in 2009? This is undoubtedly one of the best tasting yellow tomatoes to be found, combining luscious sweetness with plenty of tangy tomato flavor. Golden-yellow fruit is beautiful, unblemished and smooth, and varies from 10 ozs. to 1 lb. 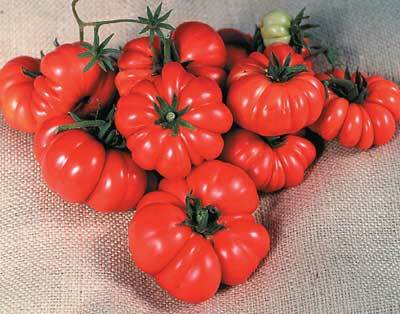 The shape is that of a typical beefsteak with very meaty interiors. Huge, vigorous plants produce well, but it is the rich, excellent flavor and large fruit size that really set this one apart. Indeterminate. 80 days. New for us in 2009. Old Italian variety that grows 6-8 ounce large, meaty, semi-pleated red fruits in abundance. While it is not the prettiest of the tomatoes, this variety rated among the very highest in our taste tests with a very earthy, old-fashioned tomato flavor. Needs trellising. When frost threatens, entire plant can be lifted, including roots, and hung upside down indoors to ripen remaining fruits. Grew this in 2007, was tasty...when it was producing, which wasn't long. Susceptible to blossom end rot. Developed in Ohio, this variety is distinctive for its fruit that averages 2 lbs., but has been known to grow to an enormous 5 lbs. 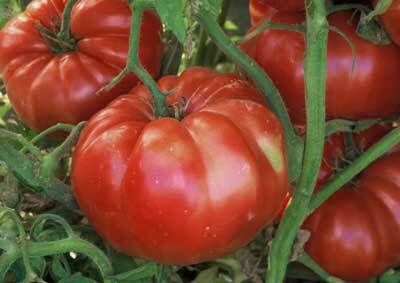 Tomatoes are dark pink and solid meat with smooth blossom ends and a delicious sweet flavor. Some folks make wine from these very sweet tomatoes. Indeterminate. 90 days. New for us in 2009. No, we won't be making any tomato wine. PULLED OUT 7/14/09. Diagnosis: late blight. Plant was never the picture of health. Determinate. 50-60 days to maturity Medium sized, deep-red skinned tomato. Fruits generally weigh 3-5 oz. Flavor is full. Fruits tend to ripen quickly, according to sources. An impulse seed rack buy at the supermarket. I couldn't resist the name.Sept. 2008 report: Bloody Butcher was quite productive throughout the season. Rather juicy, so not ideal for canning. But quite tasty in salads. 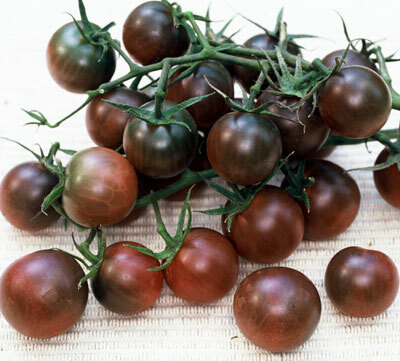 This is the first truly black cherry tomato we've found, and our own exclusive variety. It is not a plum, but a perfectly round cherry with classic black tomato flavor, sweet yet rich and complex. Fruit picks clean from the stem and is produced in abundance on vigorous, tall plants. These cherries are irresistibly delicious and a unique addition to the color spectrum of cherry tomatoes now available. Indeterminate. 65 days. New for us in 2009. A VFFNT Hybrid. Exclusive release of Tomato Growers Supply Company. The kind of tomato home gardeners would love to grow for a county fair entry. Vigorous plants produce loads of delicious 10 to 12 oz. fruit, even when conditions are not ideal. This one was a winner in our trials for its high yields, good disease resistance, mid-early maturity, and great flavor. First fruit mature early and low on the plant, which continues to bear tomatoes over a long season. Indeterminate. 75 days. Sept. 2008 report: Good looking, meaty. Good choice for main season tomato. A 1984 ALL-AMERICA SELECTIONS WINNER. Absolutely incredible set of exceptionally flavorful, firm 8 to 12 oz. fruit on strong vines with good cover and outstanding disease resistance. Large clusters of consistently large, beautiful tomatoes. Determinate. 70 days. We like it so much, we plant it every year. A Farmer Fred Favorite. Sept. 2008 report: mediocre to poor production. Hoping for a return to glory in 2009! Vigorous plants yield an abundance of 3 oz. fruits. 80 days. A good paste tomato for soups and ketchup. Vigorous plants yield an abundance of 3 oz. fruits. Disease resistant. Determinate. Sept. 2008 report: Excellent for canning purposes. Harvested 30 pounds of this for August canning. Paste tomatoes shaped like banana peppers are about 6 inches long, deep orange-red and sweet with very little juice and few seeds. These tomatoes are all meat and supposedly make great paste and sauce. Heirloom variety. Indeterminate. 73 days. New for us in 2009. A prolific and exotic Mexican Indian variety. Deeply pleated, almost triangular in shape, pink-red fruit with hollow interior. Indeterminate. 85 Days. Tends to take its time to ripen, and then overripens quickly. Very good when used at its peak of flavor. COMMENTS: Four of the so-so or underperforming tomatoes - Super Italian Paste, Viva Italia, Celebrity and First Prize - all were planted in the same bed. September pH test: 7.0, so, it's not that. Currently conducting N, P & K soil tests in that bed now. Flamingo, from Harris Seed Company, is truely unique with fruit that mature from a light yellow to pinkish-orange, then to red. 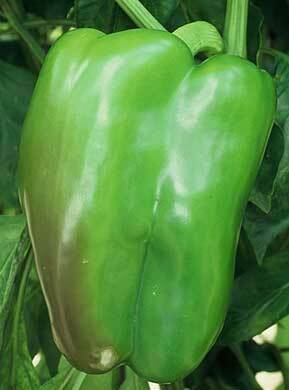 This sweet bell pepper has concentrated fruit set and can produce high yields. Similar to Gypsy, Flamingo is well sized and shaped to produce brisk sales in the fresh market. Flamingo's mostly 3-lobed fruit are medium large, smooth and tapered. Its thick walls add weight and resist bruising and breakage. Flamingo performs well in most pepper growing areas and its earliness makes it a stand-out in the northern U.S. and Canada. Outstanding for its type, Flamingo is the clear choice with earliness, yield and resistance to Tobacco Mosaic Virus. Wonderful color change through the growing season. OK taste. Good grilled. 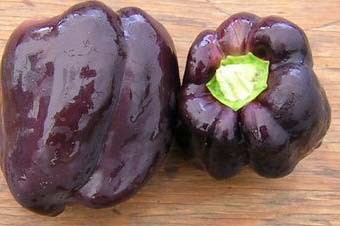 Deliciously sweet Italian peppers turn a rich shade of purple when they are fully ripe, adding a beautiful new color choice to Marconi peppers. Expect plentiful harvests of these peppers, which become about 6-in. long with a tapered shape ending in a blunt tip. Traditionally used for frying, Marconis are also wonderful when eaten fresh. Create a beautiful salad with Purple Marconi, either by itself or in combination with the red and golden versions. 90 days. Not as productive as Tequila, but very pretty. Carmen was a 2005 All-America Selection that was praised by the judges for its delicious, sweet flavor. 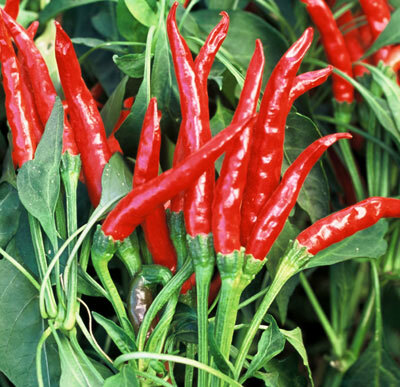 It produces impressive crops of attractive, uniform, brilliant red bull's horn type peppers. The peppers are up to 10" long and 3" wide on bushy plants that grow up to 30" tall. Carmen is widely adaptable to a variety of conditions and may also be grown in containers. 60 days green. 80 days red. Good in salads and grilled. 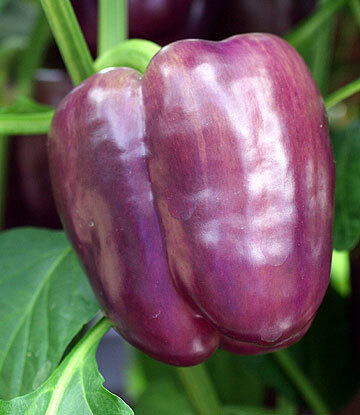 This is an open pollinated variety developed from the hybrid pepper Purple Belle. The fruits have a mild sweet flavor and are thick walled and meaty. Plants are compact with lots of protective foliage to protect the peppers from scalding. 70-75 days. Open pollinated. Very productive. Compact? Not really. Needs a small tomato cage or staking for support. 65 days. 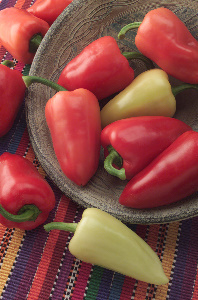 "This is a very productive version of NuMex 6-4 that offers more uniform peppers. 6 to 7-inch thick-fleshed peppers turn from green to red and are relatively mild to medium in flavor. Ripens earlier than most other peppers of its type. 65 days." 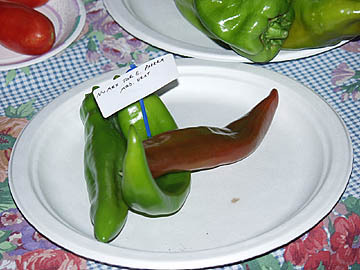 The overall winner of the Farmer Fred Pepper Party Taste Tests in August, 2000. Great in chili! A Farmer Fred Favorite. We grow this every year, great in salsas and for homemade nachos. 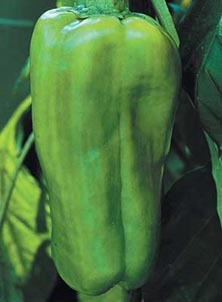 Thick-walled, cone-shaped pepper, about four inches long and two inches wide. Mariachi starts out green and ripens through creamy yellow to rose to red. This moderately spicy (500 to 600 Scoville units) pepper can get hotter if the weather is extremely hot or dry. All America Selections Winner in 2006. A beautiful, tasty pepper for salads for us in 2007. 72 days. While not technically a Marconi Pepper, it displays so many similar traits it has earned the name! Large, tapered, elongated fruits grow 8" by 3", with a sweet, smoky flavor that's equally delectable when fruits are eaten green or red, fresh or grilled. Widely adaptable, it produces larger than normal crops just about anywhere. Withstands severe weather with excellent disease resistance." A 2001 Farmer Fred Taste Test Winner. This 2001 AAS Award Winner has (in my opinion) more flavor than the Giant Aconcagua. This beautiful amethyst pepper from Holland is the best lavender variety we've seen. Fruit sets early and grows to a blocky 4-1/2 inches deep and 4 inches across. Peppers begin as lavender and stay that color for a long time before fading to a lovely orange, then finally red. All colors are jewel-like and very attractive. Strong plants are tobacco mosaic virus resistant and tolerant to blossom end rot. 72 days. The Farmer Fred Absolute Favorite Sweet Pepper! 70 days. 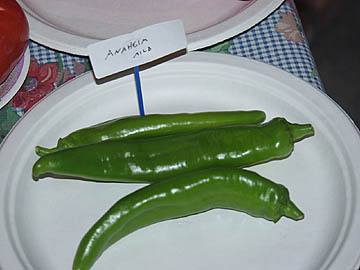 "Also know as the 'New Mexican Chile', this moderately pungent fruit is deep green, but turns red at full maturity. 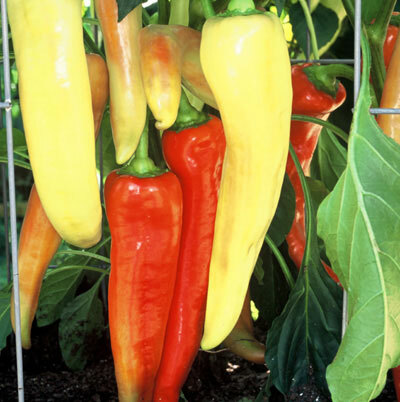 Very smooth peppers are 7-1/2 inches long and 2 inches wide and borne on tall, productive plants that offer good foliage cover for the fruit. Tobacco mosaic virus resistant. Excellent for canning, freezing or drying. 75 days." A good choice for nachos for the weak of heart...and stomach. These bright green and red sweet peppers fry beautifully. Originally from the Basilicata region of south Italy. Brought to this country by the Nardello family, who grew them for generations in Connecticut. The plants are 24" tall, and festooned with 10-12" peppers. One of my favorites for grilling. Italian 'bull's horn' colorful sweet peppers are 8 to 10 inches long and curved like a bull's horn. Ripen to deep red or bright yellow and are delicious fresh in salads, but more often are sauted or grilled. Prolific tall plants. 68 days. Gorgeous on the grill, and in salads, too. 60 days. 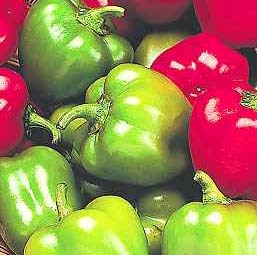 "Miniature, 1-1/2 inch blocky red and green bell peppers load up in abundance on compact plants. Because they mature so early, fruit ripens to red sooner than most varieties. 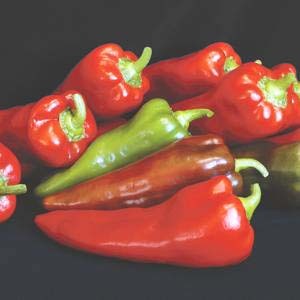 Innovative cooks will enjoy using these peppers in salads, stir fries, and for stuffed hors d'oeuvres." I like to skewer them and put 'em on the grill (direct medium, 5-6 minutes). The largest elongated bell pepper available. 3 to 4 lobes and thick walls. Plant grows to 30 inches. This improved variety sets more and even larger fruit than the original and is resistant to tobacco mosaic virus. Excellent in the Northeast as well as other areas. 72 days. New for us in 2009. This hybrid version of a Sweet Banana type lives up to its name in that it puts out an incredible harvest of huge banana peppers that measure nearly a foot long. 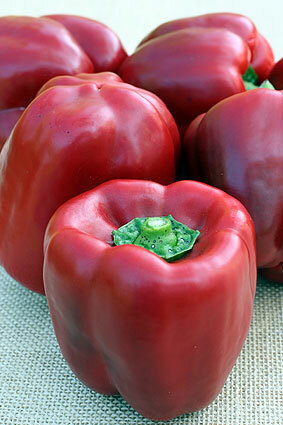 Peppers are typically 9 to 10 inches long and 2 inches across, and turn from light yellow to orange and finally red. Sweet flavor for eating fresh or cooked. 65 days. New for us in 2009. Old-fashioned bell pepper is huge - 5 to 6 inches deep and wide, but grows on a compact, bushy plant. 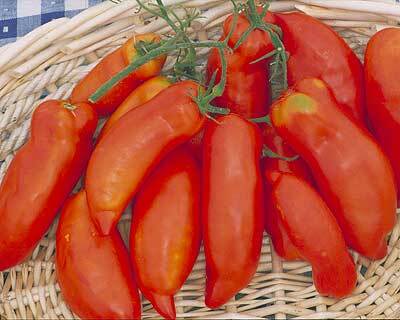 When this variety is fully ripened, it turns bright red and is very sweet. Thick-walled, blocky fruit is absolutely perfect for making stuffed peppers. Early maturity and long harvests. 75 days. New for us in 2009. 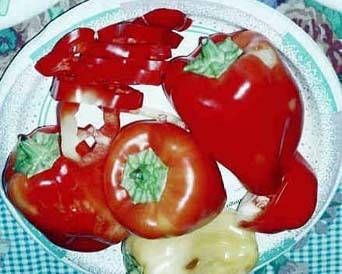 A red bell pepper widely adapted to reliably turn red in almost any area of the country. Very thick-walled, heavy fruits are blocky, and about 4 inches long. Heavy yields of bright red sweet peppers. Resistant to tobacco mosaic virus. New for us in 2009. 85 days. Plant produces heavy yields of 8" long by 1 ?" wide sweet peppers. Peppers turn from green to dark red when mature. A specialty pepper which is dried, crushed, and ground into dark red paprika powder. Can also be used fresh. 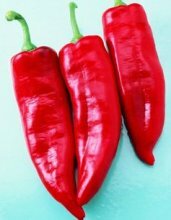 One of the highest yielding Paprika varieties on the market. New for us in 2009. Extremely hot variety originally from Thailand. 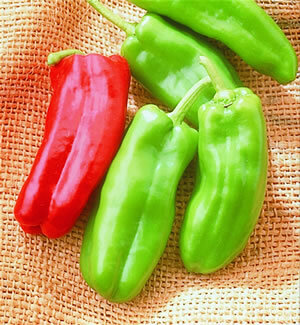 Plants become covered with 1-1/2 inch long peppers that are green at first but ripen to red. Both colors appear on the plant at the same time making this variety ornamental as well as edible. Thin fleshed peppers are used especially in Oriental dishes. 90 days. New for us in 2009.